Traditionally, the idea that the Roman empire ‘declined and fell’ was considered a historical fact, not a matter for debate. The beginning of the ‘decline’ was usually dated to the 3rd or 4th century AD. The deposition of the last emperor, Romulus Augustulus, in 476 AD was regarded as the event which marked the fall of the Roman empire in the west. 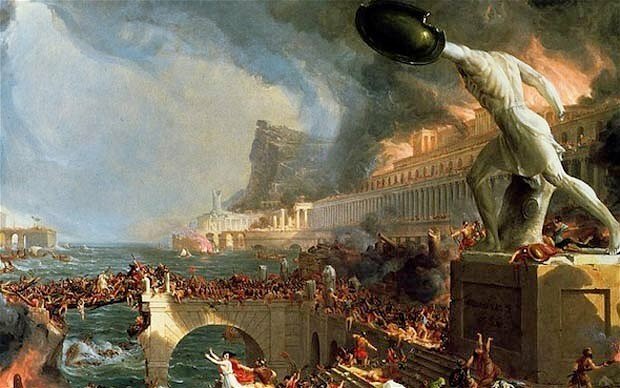 The post- Roman centuries were dismissed as a ‘Dark Age’ that followed the collapse of Roman civilisation, as a period of little importance. It was argued that there was a general absence of economic and social activity. This was accompanied by the disappearance of cities or their reduction to ecclesiastical and administrative centres, with a decline of their markets and the limited movement of goods directed by ‘complex chiefdoms or incipient states’ mainly for non-commercial ends. However, more recent historians have been revising this view over the last few decades, attempting to place the ‘early Middle Ages’ on an equal basis with other periods. Others have suggested that if the idea of a post-Roman ‘decline’ or ‘fall’ into the ‘Dark Ages’ is challenged and replaced with that of ‘transformation’ into the ‘early Middle Ages’, our view of the past is levelled out and is no longer dominated by a Roman peak of civilisation. They have also argued that ‘transformation’ rather than ‘fall’ is in general a better description of the historical changes between Late Antiquity and the early medieval period in the west.